Jeremy Corbyn on his surprising rise to the top of the Labour Party and the challenges he now faces. Of political parties claiming socialism to be their aim, the Labour Party has always been one of the most dogmatic — not about socialism, but about the parliamentary system.” That’s how Ralph Miliband opened his classic 1961 text Parliamentary Socialism , a critical analysis of the party that most of the British left wanted to capture. Miliband was skeptical of that plan. But during the great upsurges of the early 1980s — which saw the growth of a radical Labour left led by Tony Benn and others, as well as the miners’ strike of 1984–85 — he resisted the arguments of intellectuals and politicians alike, who viewed Trotskyists and “Bennites” as the source of Labour’s problems, rather than a staid leadership. That supposed realism would win the day, paving the way for New Labour and the further rightward drift of the party. Sure, some stalwarts struggled from within, but most wrote off the Labour left, and when Tony Benn passed away at the age of eighty-eight in 2014, it seemed that the project to which he devoted his life had no future. This was the backdrop for Jeremy Corbyn’s Labour leadership campaign last summer, and why his success was so stunning. Corbyn is a genuine radical and Labour’s most left-wing leader since at least George Lansbury in the 1930s. His victory was a testament to his tireless work in social movements and principled stances as a parliamentarian, but his intentions and those of the talented team around him can’t change the party alone. Corbyn will need to contend with Labour’s conservative parliamentary group and find innovative ways to restore the party’s mass base. It’s a daunting test, to say the least. 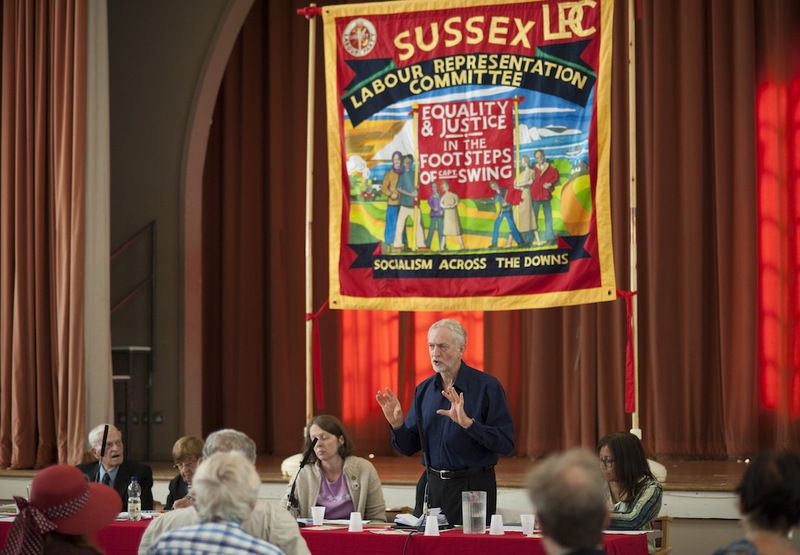 In November 2015, Socialist Register co-editor Leo Panitch and Red Pepper ’s Hilary Wainwright spoke with Corbyn on a train to London from Birmingham where he had been meeting with union shop stewards. They discussed what the leader has accomplished so far and the challenges ahead. Your remarkable campaign for the leadership not only doubled Labour’s membership but galvanized some four hundred thousand people overall to associate with the party. This is unheard of anywhere in terms of party mobilization on the Left in recent decades. What do you think it reflects about the possibilities for a new politics, not only in Britain but also more broadly — especially in Europe? I think our campaign excited people who were very depressed by the election result and the analysis that was being offered at the end of it, which was essentially that Labour wasn’t managerial enough and we had to be better managers in order to do better in the future. I only really got on the ballot paper because of a combination of people — from those who just absolutely wanted an alternative to be put forth, to those who thought that there ought to be a democratic debate in the party. This kicked off the social media campaign that encouraged others to get involved. We finally made it onto the ballot — which required thirty-five members of parliament (MPs) to sign on to a nomination — with one vote to spare and one minute to go. Then at the hustings where the party leadership debates were held, the point of view I put forth got quite a good reception. And as we started organizing fringe meetings around them, the campaign suddenly took off. The first one was Nottingham, where we organized a meeting in a room for 100, and 300 turned up. From then on they just grew, and so by the end of July, beginning of August, we were getting 1,000 people at every rally we organized. Most of them were filled up with one day’s notice. One place, we filled a hall for 1,500 with only four hours of notice on Facebook. Is it your sense that the same type of thing is happening elsewhere? Yes. Because this wasn’t anything to do with me. This was to do with people wanting a different way of doing politics — particularly the young people who came in and were very enthusiastic. Our campaign was a combination of the young and the old, very little in between — the middle-aged weren’t there. They were either under thirty or over sixty, most of the people that came in to work on the campaign, and the phone banking they did was quite extraordinary. There was one of them where I witnessed this eighteen-year-old Asian girl with a burqa — a Muslim Asian girl — explaining to a ninety-year-old white woman how to operate the mobile phone to make calls, and they were both getting on just fine. And it was kind of lovely. We had four hundred people on a phone bank one night. It was quite extraordinary. I’m not sure how much phoning they did — they did a great deal of chatting to each other. Most of our funding was raised by crowdfunding and small donations (the average donation was £25), and we got union money. So about half of it was union funded, and the other half was fundraised. What was it exactly that you were tapping into in the public consciousness? The basis of the campaign was anti-austerity — that was the whole basis of it. And the appeal for the “new politics,” the new way of organizing politics — how do you see the connections between these two themes? Oh, they’re two sides of the same coin. Austerity is essentially making the social systems of all of Europe pay for the banking crisis, and with this comes a popular sense of either resignation or anger. So the idea that there is an alternative, that we can do things differently, is very important. That is why we have had the most unremitting attacks on us from day one of the campaign. Some of it is so bizarre it’s funny. Worse than what Tony Benn experienced? Hard to tell — different time, different age. It feels bad at times, although I just never respond to any of it, whereas Tony tried to at times, and I think that’s a mistake. I mean, I don’t blame him for it. At that time, those days, I was with Tony in responding to all this. But if you respond to these kinds of ludicrous personal attacks, you then end up in a swamp or a trench with these people. I’ll give you an example. Last Sunday I was accused of not bowing properly to the queen. I decided I wouldn’t respond. Had I responded, the debate would have been about at what angle one should bow. And by now, five days on from it, anyone who hadn’t followed the story closely would say, why is the leader of the Labour Party engaged in a public debate about how one should bow to the queen? They’d think, is that all he’s interested in? I’m about to lose my house and he, the leader of the Labour Party, has got nothing to say about that. So I just took the view from the very beginning that I’m not responding to any of it. That links to a question I was going to put, which was that you have this reputation that’s sometimes symbolized — for example in Steve Bell’s cartoons in the Guardian of you as the wise, calm wizard facing Darth Vader in Star Wars — or the wise wizard in Harry Potter. You appear fearless. Have you always been fearless, or did you learn it in your thirty years as an MP? When you’ve been taking on powerful interests? Have you ever been fearful? There are two points here, really. One is that I have this eighteenth-century religious view that there is some good in everybody. Sometimes you have to search quite hard for it. Sometimes it’s very hard to find, and you wonder if it really is there. Secondly, because I’ve never had any higher education of any sort, I’ve never held in awe those who have had it or have a sense of superiority over those who don’t. Life is life. Some of the wisest people you meet are sweeping our streets. A friend of mine, a building worker (he sadly died, committed suicide last year — I was very sad about that, and I’m very sad I wasn’t there for him at the time) whose house was very simple, lots of reused this and reused that, and somebody said to him: “Jim, why do you live like this?” He said, very wise: “I live simply, that others might simply live.” And you think, hang on, that’s actually very profound. So you’ve got to have a bit of respect for people. I do have a respect for people, and I actually genuinely enjoy meeting the wide variety of people I do. My constituency has probably about seventy different languages spoken within it, people from all over the world. There’s the great, there’s the good, and there’s lots of people who have been in the prison system. They’re all there. What is fundamental is your attitude towards your environment, your attitude towards other people. Interestingly, the first leader of the Labour Party, Keir Hardie, who was a more thoughtful man than he’s often given credit for, was much more bothered about education and opportunities for women than about nationalization. Before you were elected in 1983, you were already associated with the attempt to change the Labour Party’s old statist and parliamentarist politics. Tony Benn had articulated in the 1970s the notion that the real problem is not about more state or less state, it’s about a different kind of state and, above all, a much more democratic British state capable of introducing a cooperative, egalitarian, and democratic economy. He would be so proud of you for having achieved what he wanted so badly — to be the Labour Party leader committed to this. I wish he was still here. I knew Tony very, very well for a very long time. The difference between Tony and me was that whereas he was one of those very unusual politicians who was actually very successful in a conventional career pattern, I have been monumentally unsuccessful in the conventional career pattern. The first time I met Tony was the 1969–1970 period, when he was reflecting on his experiences as a cabinet minister in the sixties. What was interesting about him then was that, whereas most of the cabinet ministers reflecting on the experience talked about the ministerial car, the mendacity of the opposition, and how they were going to win again, Tony had quite different and more interesting personal reflections on what he had done or not done. Yes, and on the basis of such reflections, he wrote a Fabian pamphlet in 1970 called “The New Politics: A Socialist Reconnaissance,” in which he surveyed all the anti-authoritarian social movements in the late sixties — Black Power, the women’s movement, anti–Vietnam War — and said, we need to bring that spirit into the party, that’s what we’re missing. You were quoted in Tony’s diaries as saying that you attributed the defeat in the 1983 election to “the great incompetence of the party machine.” So what I want to ask you is, did you mean this in the sense of its incapacity to project the promise of the new politics you shared with Tony beyond the active party membership? And does this remain the case today? I honestly can’t remember saying that, but I can imagine the thought processes I was having, which was that the party in ’83 presented a very interesting electoral platform but lots of people in the party were quite frightened of it. And the Tories were running essentially a fairly xenophobic election surrounding the Falklands War, which we never challenged. We also were faced with the SDP (Social Democratic Party) being set up by those leading Labour parliamentarians who left the Labour Party at that time, so it was a very interesting period. I felt the party didn’t really understand what was happening. But what about the incompetence of the machine? In some cases just the actual organization on the ground was very poor. Are you worried about this now? No, not at all. The party now is in a very different place. The ground operation, as we call it, in the general election was actually very good. Oh, yeah. We had more people active than many I can remember. I went to quite a lot of constituencies, key constituencies. And the membership is now much bigger — it’s double what it was. What I am worried about now is that the party needs to reach out and involve a wider range of people. That’s my main message. I’ve just been speaking in Birmingham, to a very big Unite shop stewards’ conference. I said, actually, every one of you in this room is an expert, every one of you has an opinion, every one of you has optimism, every one of you has hopes. I want a party structure and a union structure that allows your intelligence to come forward and be part of our policymaking. So we don’t go through to 2020 where I, as the leader, go away and write a manifesto. We go through to 2020 where its patently obvious to everyone in the country what our manifesto is going to be — on housing, on health, on jobs, all those things — because everybody’s had a part in it. So the need is to reach, to widen our organization to make us a community-based party. And you think the party’s regional organizers know how to do this? Well, it’s not so much do organizers know how to do it — do we all know how to do it? I’m not an expert on this, but I’ll try. We’re going to try various experiments in how we reach out and how we involve people, how we use social media, how we use digital tools to share ideas and knowledge. The idea is that we have a community conference on policy in which some people are there, some people are on Skype, some people are on a live-stream feed, some people are sending in emails, whatever. All saying something because they’ve all got something to say. It’s reaching out to people and understanding that what we couldn’t do in ’83 was win parts of the national media because the story was written by the Radio 4 Today program and the Sun . Radio 4 Today is still there, and it’s influential. The Sun is still there, and it’s influential. But they’re both much less influential than they were. I do this weekly YouTube video — the lowest viewing figures we’ve had have been four hundred thousand, the highest we’ve had is over a million. So we’re doing all of that, and I’m spending a lot of time as well traveling around on trains, like this. This links in to what we’ve done to prepare for this interview. Inspired by your approach to the Prime Minister’s Question Time in the House of Commons, we’ve asked people what questions they want us to ask you. Tim, from Barking, has a question about the democratization of the state. He asks, what your views are on a federal UK, given that new politics and democratization surely involve the sharing of power? Yeah, I’m glad that question has come up because of the problems that have arisen out of the UK being such a highly centralized state. It is changing, because Scotland is obviously very different now — as government in Scotland is devolved, it now has tax-raising powers which they may or may not want to use. But whatever the outcome in Scotland — whether independence or otherwise — England is still not decentralized at all. George Osborne is offering city devolution to some places, over which I have some concerns because it is devolution to big cities and it doesn’t necessarily include adequate funding of the services that have been devolved. So you could end up with a form of devolution that doesn’t include any kind of financial autonomy or alternative source of income. You negotiate every year on limited funding with a central government which relies on you running even more services on its behalf. The other end of the scale is the total federal model that Germany has, with not only the very powerful Länder [state] levels of regional governments but also very powerful cities and a relatively weak federal state. I think there is a very interesting debate on federal models to be had here. I don’t want us to go into government in 2020 saying simply that we are going to think about it. So I’ve asked Jon Trickett to set up a constitutional convention, which he’s doing — it’s underway now. It is looking at powers of government, powers of parliament, powers of the House of Lords, an elected second chamber. Then issues of rights and accountability in society, bill of rights kind of thing — protecting the Human Rights Act but moving on from that, of course, to how you sort English regional government. Because there are no effective regional voices, it means there is a disproportionate level of capital investment in London and the southeast compared to the northwest and northeast, for example. The East Midlands actually does the worst of every region. I put some ideas together on this during the leadership campaign as one of our consultative papers. I did thirteen consultative papers on lots of different stuff. They are on the Jeremy for Leader website. Look at those and you’ll see some ideas there. All of those are open to comment. The difficulty we have at the moment is simply the capacity we have to respond to all this, because of the volume of stuff we’re getting in. And to raise the stakes even higher, what about democratizing European institutions? Well, European institutions: I want us to approach the European referendum on the basis of demands for a social Europe, demands for workers’ rights across Europe, demands for environmental protection across Europe, and turn it into a debate about: do you want a free-market Europe that controls people, or do you want a Europe where the people control the market? Essentially advancing that kind of alternative. Now I’m not sure how far we’ve got with that debate — there’s a long way to go. I’m having a lot of discussion with a lot of union people on this at the moment. Our problem is simply the capacity to respond to everything. After only two or three weeks in office, we discovered we had a backlog of a hundred thousand emails sent to me. We had a backlog of a thousand invitations to speak at places all over the country, and all over the world for that matter. We started from scratch with our office, so just the sheer management of issues related to this is huge. It’s now much better, it’s getting better. We’ve got more staff in place, a better team in place. It’s growing, but it is quite difficult. Also I’m quite concerned that if I spend time in the office someone will always find something for me to do. There’s always a crisis that needs your urgent attention. If I wasn’t there, either the crisis wouldn’t happen or it wouldn’t need your urgent attention. But the fact I’m there means that it becomes my problem, not somebody else’s. So I’m quite assertive about the need to ensure I go traveling around the country. I’m doing basically three days traveling every week. So we’re going everywhere. I did over a hundred events during the leadership campaign and by the end of the year, I will probably have done four hundred to five hundred public meetings. How do you organize the input you get through those meetings? That’s the hard part. It can’t all reside in my brain — it’s not capable of retaining all this information. That is actually the problem area, how we deal with all this. And so, when we’ve finally got the rest of the team in place, we’re going to look at much more interactive websites and interactive ideas. A lot of it is depending on computers and social media. You couldn’t do this without computers and social media. I think back to the Tony Benn deputy leadership campaign in 1981. I think of the miners’ strike in 1984. I think back to the industrial democracy movement in the early 1970s. All of which I was very involved with, but they would have been so much more successful and so much better if we’d had better forms of communication. We had to write letters to everybody, and spent a lot of time licking stamps. This leads into another question concerned with the party. It’s from Thomas Barlow: his question is, how are you going to open up the party — both the party apparatus and the Parliamentary Labour Party — to democratic inputs and participation in policymaking? And I might add, how far could your own Islington North constituency party (CLP) be a participatory model for the rest of the party? There’s no perfect model, but what I say to anyone active in the party is that we’ve recruited 200,000 new members, but please don’t take them to the branch meetings. You get to your average branch meeting and you’re discussing the minutes of the last meeting — it’s not necessarily very attractive. My constituency party is not perfect, but we have a very large membership. We’ve got 3,300 members in my CLP and 2,000 registered supporters. We’ve got 5,000 people, and the Labour vote is 30,000 — so one in six of the Labour vote are members of the party. So how do you involve them? We have thought a lot about how we conduct meetings. Our normal monthly meeting has a guest speaker, a discussion, a report from me, and then after an hour and three quarters, we do the business in twenty minutes. So have you sent this out to other CLPs, to the regional organizers? This is where it’s going. We’ve organized a very interesting national executive “away day” where I’ll be presenting ideas on this. It will be, don’t worry. The word will get out there, and one day the BBC will mention it. Maybe you could do a little film of sort of your local party in action showing what meetings could be like. Yeah, but the whole thing should not be personal around me. Then, moving on beyond the personal, how far could this model influence the Parliamentary Labour Party — so the issue is less whether MPs will be reselected as candidates for the next election by each of their constituency parties, but more that they face local parties that are so full of energy and capacity that they can’t resist the new politics agenda by clinging to the old politics. Are there red lines you won’t cross, apropos of this? Yeah, I mean, my views on nuclear weapons are very well known. My views on social justice are very well known. My problem is all my views are extremely well known on everything. To be fair, you get a lot of noise from a small number of members of the Parliamentary Labour Party. But there’s a much larger group that are actually very interested — very interested in who has joined the party, very interested in the fact that their membership has doubled. Some are nervous, some are concerned, some are excited. We’re all humans. We have to try and understand people. My natural, default position is to work with somebody, not against them. It does make my life quite busy. Well it’s about the psychology of our society. It’s exactly where we started. Is socialism just about state power, state control, state ownership, and so on, or is socialism about a state of mind of people? I think the response across Europe to the humanitarian crisis of Syrian refugees is very interesting. The Hungarian government are not very nice people, and very nasty towards asylum seekers and refugees. But when those poor Syrians were trying to walk through Hungary to get to Austria, ordinary people came out and gave them clothes and water. They could’ve been throwing rubbish at them. They could’ve been attacking them. They weren’t. There is a basic humanity towards other people. Of course, you have to unlock this when young people are brought up to understand their history and their culture largely in terms of consumerism, competition, and self-advancement. So my absolute passion is that, starting with preschool facilities, the emphasis should be on schools as places of social interaction, where people learn to play together, and where they are asked, is the advance of a community the ability of somebody to get very rich at the expense of others? Or is the advance of the community when there is nobody homeless, nobody unemployed, nobody sleeping rough? So, it sounds like you are actually enjoying yourself in this new leadership position? Yeah, of course I am. Yeah, I was pushed into this, but I’m happy I was. Are there any surprises? I mean, is it as you expected? Or are there things that are different, for good or ill? I feel constantly concerned that I’m spending all this time doing everything involved in all my leadership activity, and sometimes I feel a tear between that and my responsibilities to the community that I represent. So I have a weekly fight over the schedule set out in my diary. That’s where I do get quite assertive, because I insist on spending time with those people and groups I always have represented even while now also traveling across the country — and also I make sure that I have time for myself. Half a day, or a day a week, so I can dig my allotment. Ok, just one final question. You are known for your exemplary lack of sectarianism. You work with whoever is on board for the cause. You worked with the Greens, for example, in Stop the War, on anti-austerity platforms, and so on. Now people are worried about the party’s electoral approach to the Greens, and in particular whether the Labour Party should stand down in the next election from challenging their leader, Caroline Lucas, in the Brighton constituency where she is now MP. How does a non-sectarian ethic extend to that level as a party leader?That’s tomorrow’s problem, that’s not today’s. We’ve got to build the ideas, then develop the movement, and then we’ll see. Today is what we’ve achieved so far. That’s tomorrow’s problem, that’s not today’s. We’ve got to build the ideas, then develop the movement, and then we’ll see. Today is what we’ve achieved so far. Jeremy Corbyn is the leader of the UK Labour Party. Leo Panitch is a professor of political science at York University and the co-editor of the Socialist Register. His latest book, with Sam Gindin, is The Making of Global Capitalism. Hilary Wainwright is a co-editor at Red Pepper.